A few years ago, a TV program showed how they commercially make maraschino cherries and OMG – I never wanted to eat them again! Why? Because they process those cherries in such a way that they really are no longer cherries. They first remove any trace of cherry flavor by soaking them in a “brine” of chemicals that bleaches them yellow/white. (This is not a brine as we know it in pickling. It is a chemical cocktail.) Then, they soak them for several days in high fructose corn syrup and red dye so that they look like a cherry again. I wouldn’t even consider it food anymore. It is more of a cherry-like substance. It was gross. So I thought…Why not make them myself? Well, it turns out that there is a wide range of techniques for making maraschino cherries at home. I ended up testing about a dozen recipes. I tried alcohol and non -alcohol versions. Some recipes requires a long brining process with salt. I even bought a special, hard to find liqueur that was suggested in a few other recipes. I also tried a variety of spices and extracts. And although all of the recipes were interesting, most were a little disappointing. Of course, I ate them all anyway because…this was science! I figured the issue was that the chemical-laced flavor I was used to in a maraschino cherry was not easy to duplicate. Ha, ha, ha! That chemical flavor was not my goal. I wanted sweet flavor, with a hint of what the maraschino cherry of my childhood tasted like. I was on a quest to find a preserved cherry that was delicious on its own and I would enjoy eating on top of a hot fudge Sunday or soaking in a Tequila Sunrise. What I have below is a version I created from all my testing. It tastes like a spiced cherry with a hint of almond. You see – the almond flavor is what I found to be most important. Commercial maraschino cherries have a lot of almond extract in them. So if you want something that reminds you of the ones you ate as a kid, almond extract is the key ingredient. COLOR: Don’t expect homemade maraschino cherries to look like the artificially colored red (or green) ones in the store. These cherries are REAL and will darken with time but still taste delicious. STEMS: I like to leave the stems ON the cherries, but you do not have to. THE PITS: You need to pit the cherries. This can be tricky when leaving the stems on. Of all the cherry pitters I have tried through the years, my current favorite is the Leifheit Cherry Stoner. (affiliate link) If I carefully place each cherry, it makes a clean hole without ripping the stem off. But what I really like about this pitter is that if you don’t have stems (like for a pie filling), you can move pretty fast. My kids rapid fire the cherries very quickly through this thing. I make these cherries in small batches because I generally only need a few at a time. I store them in the refrigerator for up to 6 weeks rather than can them. I have instructions for water bath processing below, but the 25-minute process time does change the texture of the cherry somewhat (softer). So I rarely can them. This recipe is for one pint-sized jar. You can easily double or triple the recipe if you wish to make more at a time. I tell you what to add to “each jar”, in case you are doubling the recipe. In a small saucepan over medium heat, combine water and sugar. Heat until sugar is dissolved, stirring gently. Set aside and let cool to room temperature. Add lemon juice and vanilla and stir again. Wash cherries, leaving on the stems. Add the cinnamon, allspice and almond extract to each jar. 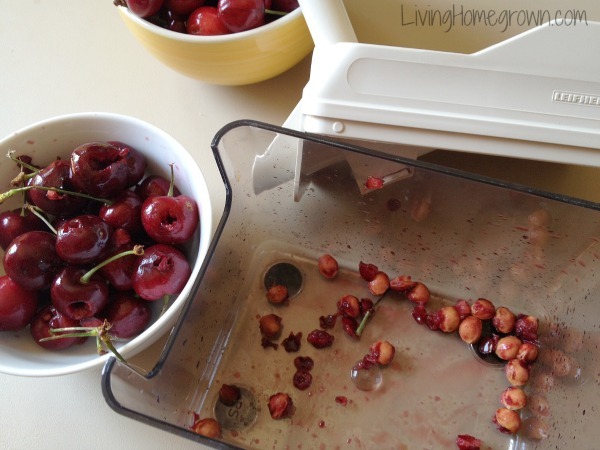 Fill your jar with the pitted cherries, leaving a 3/4 inch headspace. Pack the cherries in tightly without smashing. Pour in the flavored syrup, leaving a 1/2 inch headspace. Wipe the rim and place on the jar lid. At this point, you can store the cherries in the refrigerator for up to 6 weeks or water bath process them for longer storage. (See below) Just note that the water bath does change their texture a bit. They will darken and get softer. Either way, the flavor will take at least 3 days to soak into the cherries and then they are ready to eat. Water Bath Processing: For long-term storage, process the pint-size jar(s) in a boiling water bath for 25 minutes. Adjust for altitude if you are above 1000 feet. Here’s a post explaining why you need to adjust for altitude. 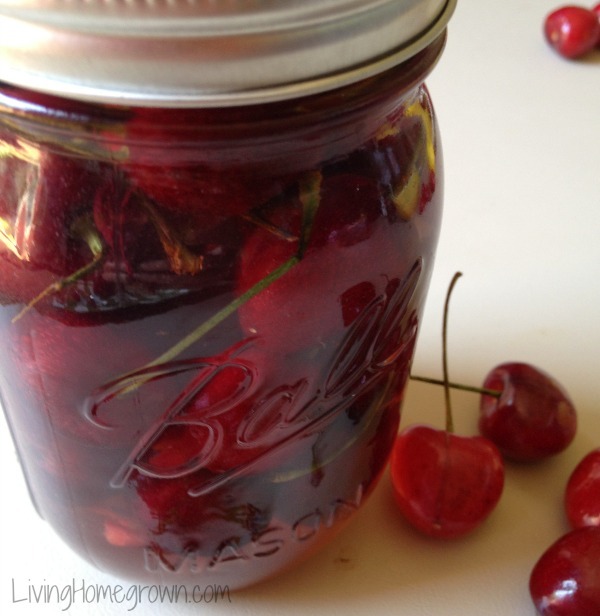 Have you ever preserved cherries in liqueur or brandy or some other method? Tell me in the comments! I buy tart (Montmorency) cherries from an orchard in my region and after making gallons of jam and freezing some for pies, I put up several jars of cherries in bourbon. Why bourbon? Because we like it! They make a delicious garnish in a drink, and not only a bourbon-based drink. I like to drop a couple in a glass of champagne or a mimosa and even in a gin and tonic. So versatile and delicious! Bourbon sounds good to me! Yum! So are the only ingredients bourbon and cherries? Hownlong is the shelf life? My family has a Mesabe (semi-tart) cherry tree that will be ripening in a month or so …. Do you think this recipe will work well for them or not? I’ve wanted to make my own maraschino cherries for a long time now but never found the right recipe. Thanks! I developed this recipe using sweet cherries so if you use a tart cherry, you may need more sugar in the syrup to get a good balance. I would try it as is first and see how you like it. (You can tell after just a day or two). If you want it sweeter, add more sugar to the syrup (like 1 cup water to 1.5 cups sugar). Otherwise, it should be fine. e – when you say you put up some in bourbon, do you process them? or just put them in your pantry or fridge? Sorry, but I am pretty new to canning – but am hoping to preserve as much as I can while things are in season or in season at the markets and stores. Thanks. How do you keep t from molding? It wont mold. The alcohol preserves it. I have cherries that is soaking for 5 years now and its potent but still as good ad day one! This looks like a “must try”!!!! Thanks Renee. You will love ’em. YUM! 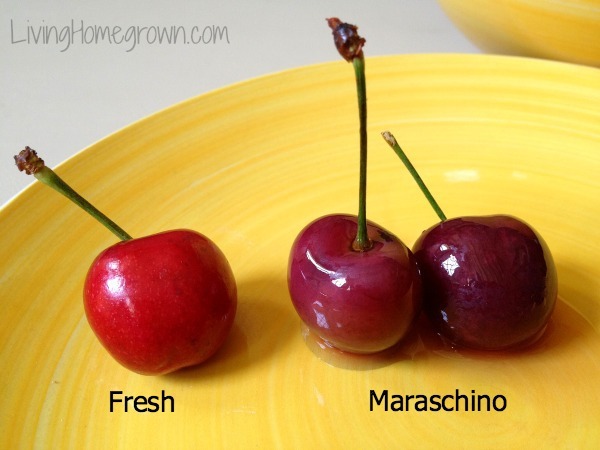 I definitely have to make maraschino cherries this season. I’ll be watching to see when our local orchard has cherries available. Thank you so much for sharing this recipe! You are welcome Gen. Hope you enjoy them! Has anyone bought the store bought maraschino cherries and recanned them in pint jars? I would like to do this. Is there a recipe for this or will they become mushy? Hmmm..I would suspect they would become mushy. But why would you want to do this? If you want them sealed, they come sealed. You shouldn’t have to recan them. And you would have to come up with a new brine solution to do this. You can’t use water. They won’t stay preserved. glad i found you and am looking forward to receiving your updates!!! I’m glad you found me too Vivian! I love cherries but have always hated maraschino cherries. Now I know why! Oh yeah Sue! I’m happy to know you are going to give it a try. Enjoy! Could you use this recipe for something like blueberries? the reason I ask is because I tried a box of chocolate covered blueberries this year. I don’t normally buy chocolate covered cherries at the store because for Christmas I always make my own… so much better than store bought. So I thought if I could do blueberries like the cherries here – I could do my own version of the chocolate covered blueberries that I bought. Gosh, I don’t know how blueberries would turn out Janelle. I guess you could just try it to see? 25 minutes seems long in a water bath. I am used to doing jams. If memory serves we only do them for ten minutes. What’s the difference? The time for this recipe is based on USDA canning standards. It has to do with the density of the cherries. The proper temperature must not only penetrate the entire whole cherry. It must be maintained internally for a specific amount of time. Many times denser food products have longer process times. With jam, the temperature can penetrate easily and therefore more quickly. Instead of bourbon, try Amaretto. It has the almond flavor of Maraschino cherries. We have a Montmorency cherry tree going in our orchard but it’s still a small tree and only produced a small amount of fruit this year. So I’m excited about trying your recipe because it’s just one jar at a time, plus it looks so simple and fresh! Thinking I’ll need to increase the amount of sugar though. Thanks! In a quart jar, I put about 1 cup of tart cherries and 3\4 cup of sugar, and fill to the base of the mouth with the cheapest vodka at the liquor store. (The more expensive vodkas tend to have more added sugars and just don’t do as well.) Shake them every hour or so for the first 4—5 hours. After that, shake them daily for the next week. Store them in the back of your pantry or basement for at least 3 months. This makes the most wonderful cherry flavored vodka that’s smooth, sweet, and very easy to sip on, or mix with 7up, juice or other concoctions. My family calls it cherry juice. It is very strong because the fermenting makes the vodka stronger, so be careful. It goes down so easily, and the cherries taste very good, but very strong. You can add vanilla extract (1 tsp) or a piece of cinnamon stick. I have also tried this with spiced rum (reduce the sugar to 1/2 cup) and it’s *really* good, straight for sipping or in coke. I’m trying it this year with straight rum. We’ll see how it goes. I also want to try it with bourbon. I started making these today, and they make great Christmas gifts. (If you let them sit for 6 months, it’s even better!) This is a family tradition in my husband’s family, and since my father-in-law passed away, I’ve taken over the “art”. Enjoy! I’ve made cherry brandy with 500g cherries with the skin cut to let the juice out, to 150g or 200g sugar (depending in how sweet you like your liqueurs) and 500ml brandy – leave for a few months. It’s fab neat and in cocktails. And even better you can make lovely chocolate liqueurs with the drained cherries…. just dip in melted chocolate! Dark or white is the best. Although they only last 2 days before the chocolate starts to go soft….. not that they last 2 days in my house!! I suppose you could roll the cherries in icing sugar & cornflour mix if you wanted to give them more of shelf life. I just keep a jar of drained cherries in the cupboard til I want them. I am making these right at this moment and I have a lot of the syrup left… What did I do wrong? Do you have to boil down the water and sugar mix and not just heat? Combine all ingredients in a half gallon mason jar. Store in a cool, dark place for one month. I do not pit mine. Hello, I would love to make this.. My question is: I like the juice more then the cherries.. When we buy them in the store the juice is always gone before the cherries… lol I mix the cherry liquid with other drinks. Ya know Cindy – If you like the juice, you should just make this recipe up WITHOUT the cherries! OR steep the cherries and then remove them. (In other words, infuse the syrup with the cherry flavor) It could be like a beverage syrup for you. Make a double batch, even. You could pour some of the finished syrup in a tall glass with ice and add some soda water. Yum! Iknow this thread is older but…To make more juice or no cherry, they sell tart cherry juice. Might try the recipe with that and no cherries. My question, has anyone tried the above recipe using dried cherries? Though not the same texture or shape, would the flavor be right? 1.) combine the water, sugar, lemon, vanilla, & cherries as per recipe steps 1 – 5. 2.) Place in a blender at medium speed until cherries are chopped very fine. This releases more cherry flavor so you may or may not increase the amount of almond extract in the next step. 3.) Prepare the jars with cinnamon stick, allspice, & real almond extract. 4.) (Optional) Pour the cherry juice through a sieve. Use a spoon or pestle to stir & squeeze the juice through the sieve as necessary, periodically cleaning the cherry remnants out of the sieve to unclog it. Alternatively flip the sieve over and run it under hot water in the sink to clean out the cherry remnants. Continue to strain the cherry juice until it is all gone. 5.) Seal the jar with or without the water bath. 6.) Turn the jar upside down 2 or 3 times to mix. 7.) Place the jars in the refrigerator ( or in the back of a dark cupboard if you used the waterbath ) for 3 – 5 days before using. If you use the water bath method please refrigerate after opening. My refrigerator is kept between 33°F & 35°F to maintain the safety of the food longer. Use a quality refrigerator thermometer to monitor the temperature. 8.) The flavor will mature the longer you wait. You can adjust ingredients to suit your taste. I will use more almond and less sugar if I am going to use it as a mixer or topping. For juice kept in the refrigerator remove the cinnamon stick and allspice when the flavor is perfect for your taste if you do not use it all up at once. Thank you so much for the recipe- I can’t wait to try! I have so many leftover cherries from the last batch I bought. I fill a gallon jar with cherries, no stems but I leave the pits in, 6 cups of sugar, 1.75 liters 100 proof vodka, shake every day until the sugar dissolves, leave in a cool dark place for 6 months, throw away the cherries, drink the liquor in small shots! We discovered we have a maraschino cherry tree and its producing lots of cherries for the first time in 8 years. It looks like I can clean and freeze some for later, but I want to make a cobbler now. Do I de-stem and pit then use your recipe?. Do I store them for 3 days then use any cherry cobbler recipe? 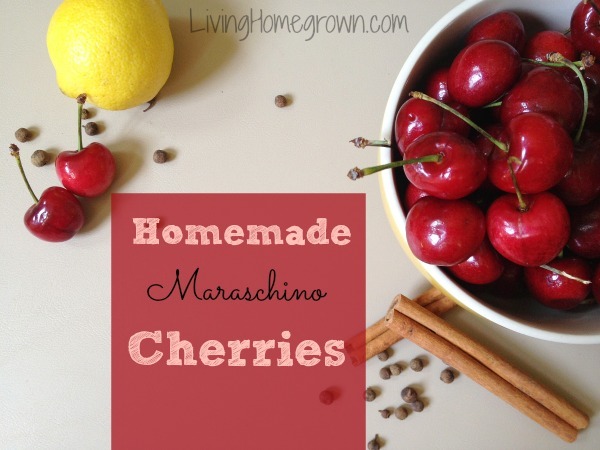 Just discovered homemade maraschino cherries and I am totally hooked! Made mine with maraschino cherry liquor. So delicious in an Old Fashioned cocktail. Cherries are very versatile, nutritious and delicious. A related preparation is to dry the halved cherries before soaking in the liquid. That way, they absorb more and get sweeter. You can dry them yet again and repeat to make them like candy. These are much more flavourful than raisins, cheaper if you have your own trees and they keep well in a smaller space. My mother used to use them in cinnamon buns. This is the perfect solution for those with too many trees or too much fruit. Generically, this technique is called “candied fruit” and can be used on any fruit with a firm texture. Of course, in this age of “sugar-hatred”, this might be deprecated but I’ll always remember those buns. I like the crunchiness of maraschino cherries. Will these be crunchy or soft? Hi Jan – They are soft – not crunch crisp like the commercial ones. But the flavor is great! Leave a Reply to Claire Click here to cancel reply.